Your dog's teeth can be a clue to his age. Figuring out how old a dog is by looking at her teeth is more of an art than a science, but a close look can often give you a pretty good idea. It’s easier if she’s a young puppy, but the teeth on older dogs hold some clues as well. Open the dog’s mouth so that you can see all of the teeth. Dogs that aren’t used to this may resist, so be prepared to stop and have a veterinarian do the checking if necessary. A dog that is uncomfortable might pull back forcefully, try to keep her mouth away from you, lick her lips a lot or tighten her jaw muscles. Dogs that are very upset might growl. Do not ignore these warnings. Any of these indicators mean it’s time to let the vet step in. Look to see if she has puppy teeth, adult teeth, or a mix of the two. 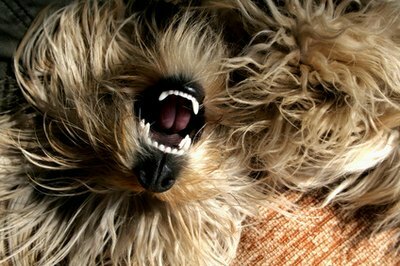 Puppy teeth are typically much smaller than adult teeth; they are very sharp and they are usually bright white. Check to see is she has all 28 of her puppy teeth in place. If so, she is likely between 8 weeks and 3 months old. If she still has baby teeth erupting, she’s younger than that, which can mean that she might need special care; puppies younger than 8 weeks should be living with their doggy mother. If that’s the case, ask your vet for advice. Determine whether her permanent incisors – the front teeth – are coming in. These are usually the first permanent teeth to show up, and seeing them means that the pup is about 4 months old, give or take a couple of weeks. The canines are usually the last to come in, so if you don’t see them yet, she’s likely 6 months or less. Verify that she has all of her adult teeth, meaning that she’s past the puppy stage. If she has most or all 42 of her adult teeth, she’s around 5 to 7 months old. Once she reaches this point, the color and condition of her teeth, rather than the type or number, will give you an idea of how old she is. See if her teeth are mostly white, or perhaps just a bit dull, with some yellowish tartar starting to build up on her back teeth. If so, the dog is about 1 to 2 years old. If all the teeth show some tartar, and you can see worn places on the tops, she is around 3 to 5. A lot of tartar and tooth wear, along with pigment spots along the gums, tells you the dog is between 5 and 10, and heavy wear, missing teeth and a lot of tartar indicate she’s around 10 to 15 years old. Dogs that have had good dental care might appear to be younger than they really are. Many factors, such as breed, can affect the accuracy of your age estimate. Giant breeds, such as Great Danes and Irish wolfhounds, age quickly and might not live past the age of 7 to 10, while toy dogs such as Chihuahuas age much more slowly. It is common for young tiny dogs to have bad teeth, because they are so often fed only soft foods, and tartar can quickly become a problem. Giant breeds might die of old age before they begin to show significant tooth issues, though a lot of wear on the incisors is not unusual. Don’t let your fingers get caught in the dog’s mouth. Even if she isn’t trying to bite you, you can end up with holes in your fingers if she closes her mouth on your hands. Puppies can be especially squirmy when you’re trying to handle their mouths, and it can be particularly painful if you get pinched with sharp puppy teeth. Always ask a vet for help if you aren’t comfortable with what you’re doing.